A history of the Battalion and the men who served with it in the Great War. John Hartley is author of a history of the 6th Battalion of the Manchester Regiment, compiler of Stockport’s roll of honour website, and a frequent contributor to the Great War Forum. 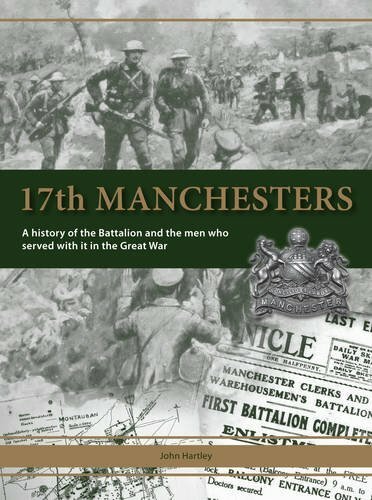 In this book he turns his attention to another of the Manchester battalions, the 17th; one of the city’s pals battalions and the one in which his Grandfather served. The battalion saw action in the Somme campaign, at Arras, on the first day of Third Ypres, and during the German spring offensive. The book is split into two sections. The first deals with the history of the battalion during the war. Using the war diary, supplemented by the battalion history, personal accounts and diaries, letters, and newspapers, Hartley presents a comprehensive overview of the movements and actions of the battalion. The second part of the book focuses on the men, providing brief biographies of the original pals who sailed with the battalion in November 1915. Whilst this is a rather arbitrary distinction (as many more men of course served with them during the war), it is one Hartley had to make in order to keep the size of the book manageable. Nevertheless his efforts in researching around one thousand individuals is quite an undertaking and must be commended. The information about the men is taken from a variety of sources, including service records, the Commonwealth War Graves Commission database, census records, and local newspapers, supplemented by photographs of the men where available. The text is lavishly illustrated with a vast array of contemporary photographs that help put the narrative in context, from photographs of the battalion’s platoons to pictures of the men at work and rest, maps, and pictures of the battlefields. The collection of pictures Hartley has built up is quite impressive and really helps the reader to build a picture of the battalion during the war years. This is a large book, both in terms of content and physical size, and this is reflected in the price tag. However it is a rich mine of information for those with an interest in the battalion and the men who were part of it, and is a must have for anyone with an interest in the battalion or the regiment.